I created LDS Symbol Cards but didn’t really do much in the way of providing instructions. I thought I’d put together a little video that explains their origins and how I use them personally. Even if you don’t have any cards, but still like symbolism, there are some cool little nuggets in there. If you have ordered some LDS Symbol Cards in the past, I’d love to hear any personal insights or ways that you use them in the comments below. If you bought some cards, I’d really appreciate a review over here. 1. To creep up by little and little, or step by step; to mount or ascend, by means of the hands and feet; to rise on any fixed object, by seizing it with the hands and lifting the body, and by thrusting with the feet; as, to climb a tree or a precipice. 2. To mount or ascend with labor and difficulty. 3. To rise or ascend with a slow motion. 1. To ascend by means of the hands and feet, implying labor, difficulty and slow progress; as, to climb a wall, or a steep mountain. 2. To mount or ascend, with labor or a slow motion; as, to climb the ascents of fame. I’ve always loved dictionaries. I remember back in school when I used to finish my work, I loved to just read and explore the dictionary. Before the Internet, encyclopedias were my Google, I loved learning about every sing topic. I still remember being a teenager and sitting down to read the entire Bible Dictionary front to back. In a matter of days, I felt like my knowledge concerning theology had doubled. I still love dictionaries and the powerful, sometimes transcendent ideas conveyed by simple words. The Interpreter Foundation has announced the availability of the videos of the presentations given at the 2014 Temple on Mount Zion Conference which took place on 25 October 2014 in Provo, Utah. Videos of each of the presentations are now available for free viewing on The Interpreter Foundation’s YouTube channel, or on MormonInterpreter.com. They are also embedded below for your convenience. There is also a YouTube playlist available of the conference presentations. The conference proceedings will also be published in book form in the future. LDS Symbol Cards are GO For 2014! OneClimbs reader, Richard N., posted a portion of this quote in a comment a few days ago. He was kind enough to transcribe the full quote from an audio CD by S. Michael Wilcox. “Part of our problem is that we are not particularly a symbol-oriented people. We like prose; well-written sentences laid out so carefully that you can’t misunderstand them. We are not big on poetry; we don’t read very much of it, particularly any serious kinds of poetry. We like the Doctrine and Covenants. It lays out ideas line upon line, precept upon precept, building upon each previous idea. We’re not big on the Old Testament. It is so large, and it is full of strange things that are going on there that we’re not always familiar with. We like Nephi. He says, ‘My soul delights in plainness.’ We’re not wild about Isaiah. Isaiah uses all kinds of word-pictures. And he loves pronouns and doesn’t particularly feel it necessary to give you an antecedent to the pronoun. The good news is that you can learn this stuff, and it is very rewarding. I grew up completely oblivious to most of what I know now, and I acknowledge that I am still only at the very beginning of a long journey. I drive back and forth from Nevada to Texas a few times a year so I’m not a big fan of long journeys. Perhaps thinking about it as a journey is part of our problem. We mark out a “point A”, a “point B” and sigh as we consider the distance. Why do we do that when we do not even comprehend what lies at “point B”? I’ve found greater peace in just appreciating what I am becoming day by day; is there even a “point B” in eternity? 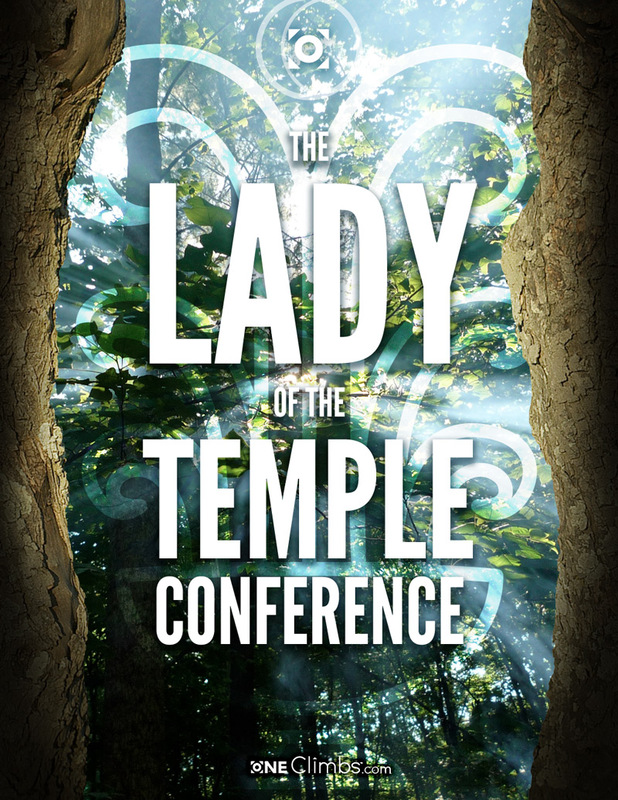 This conference which took place on October 23, 2013, in Logan, Utah was filmed and posted here at the Academy of Temple Studies and at TempleStudy.com. First off, let me just say that I was really blown away by this conference; the insights presented were so rich, edifying and paradigm-shifting. Posting this today is a bit symbolic to me personally because today I celebrate two birthdays; the day I was born of my mother in the flesh and the day I was baptized by water and the Spirit by ordinances administer by my father. As important as fathers and priesthood authority are, it is equally important to understand mothers and motherhood and how each plays an essential role in our salvation. Just so you know, I don’t post anything on oneClimbs.com unless I feel that it is of particular value. I recommend viewing all of these videos and not skipping a single one because they build upon each other. If you are a woman, then stop what you are doing and watch this conference! I was the only boy in my family and was blessed with three little sisters, and as a father, I have been blessed with three little daughters, so the role and divine purpose of women is something close to my heart. I think that the information presented in this conference will be part of a greater understanding of women in the plan of salvation. For those who have seen the original Karate Kid movie you’re probably familiar with the famous “wax on, wax off” lesson that Mr. Miyagi taught Daniel. I like the updated version of this lesson presented in the new Karate Kid movie starring Jackie Chan. You might be wondering what this has to do with ordinances – bear with me. It is easier to fill an empty vessel than a full one. Are we willing to make ourselves that vulnerable? Are we willing to sell all that we have acquired for the pearl of great price? Symbols, Images, Types, Metaphors, Similes, Parables, Motifs, Archetypes and more! Perhaps most of us throw around the word “symbolism” without understanding the various nuances of the subject. I created ldsSymbols.com with reference to the word “symbols’ because that is what most people understand. Alonzo Gaskill’s book “The Lost Language of Symbolism” defines symbols, images, types, metaphors, similes, parables, motifs and archetypes. 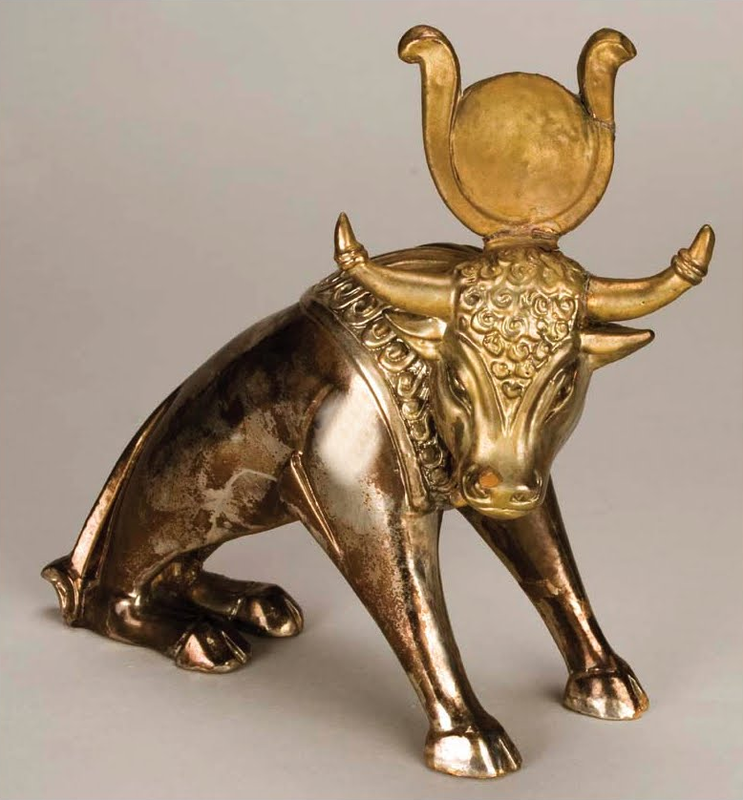 He also mentions other categories such as analogies, comparisons, emblems, figures, hallmarks, insignias, models, seals, signs and tokens. Symbol: Something that represents another thing (p. 11). Image: A word or action that names a concrete thing (p. 11). Type: A symbol that looks forward to an antitype for future fulfillment (p. 11). Metaphor: An implied comparison (p. 13). Similes: Compare one thing to another by using the formula like or as (p. 13). Parable: Brief stories that employ familiar situations, events, characteristics, or elements in order to teach important spiritual truths (p. 14). Motif: A recurring theme or a “structurally unified verbal whole” (p. 14). Archetype: An image or pattern that recurs…the universal elements of human experience (p. 15). What is mysticism? That is the million dollar question. It is incredibly difficult to define. Wikipedia defines it as the “pursuit of communion with, identity with, or conscious awareness of an ultimate reality, divinity, spiritual truth, or God through direct experience, intuition, instinct or insight.” What? By combining all possible definitions into one, they have created an incomprehensible one. Let’s turn to some closer associates. Hugh Nibley once defined it, quoting Eduard Lehmann, as “an intuitive and ecstatic union with the deity obtained by means of contemplation and other mental exercises.” Professor William Hamblin turns to oft-repeated definitions such as “a domain of religion that deals with the search for and the attainment of a profound experiential knowledge of God or of ultimate reality,” or, “mysticism is … a type of religious experience which involves a sense of union or merging with either God or an all-pervading spiritual force in the universe,” but finds even these lacking. In Kevin Christensen’s recent Interpreter review of Margarget Barker’s book Temple Mysticism: An Introduction he indicated that his “favorite LDS approach” to the topic has become Mark E. Koltko’s essay “Mysticism and Mormonism: An LDS Perspective on Transcendence and Higher Consciousness,” found in the April 1989 issue of Sunstone. We’ll come back to this shortly. Christensen notes that while Nibley’s view tends to be the more conventional definition, Margaret Barker’s own use of the term in her book is very different still, focusing on the experience of “seeing the Lord,” i.e. a temple theophany. While different, there is clearly overlap between the ideas of “a union with deity,” and “seeing God,” as Matthew Bowen also elucidates in his recent article in Interpreter. Koltko’s essay also perhaps helps bridge the gap. Freshly led out of Egypt, the children of Israel were delivered by a series of miracles that seem like they must have been incredible to witness. Camped at the base of mount Sinai, they were left alone without their leader, Moses. During this time they could have lived by the memory of what they had seen, they could have remembered and been true to what was shown to them. Instead, in a matter of days they were building new gods to worship. How quickly they had forgotten, how unable they were to walk when left alone. The following is a few excerpts from a paper written by Terryl L. Givens called “Letter to a Doubter” which I read recently on Mormon Interpreter. He illustrates this principle of patience when walking alone and the importance of remembering. Ancient Israelite temple vestiture and ritual. 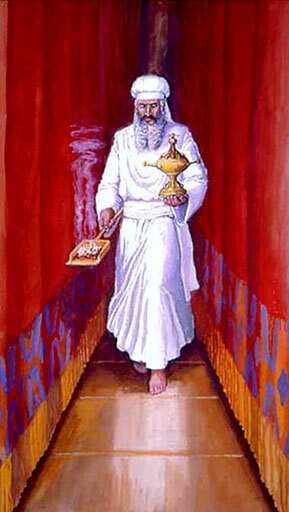 The High Priest wears his special linen garments, sash and turban during his once per year entry into the Holy of Holies on Yom Kippur, the Day of Atonement. 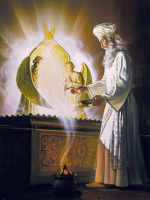 He approaches the Ark of the Covenant beyond the veil with the incense shovel in one hand, the smoke representing the prayers of the Israelites, and small vessel of bull’s blood in the other hand, the sin offering (atonement) on behalf of all the Israelites. Image based on Leviticus 16 and Exodus 25-31 and Exodus 35-40. Professor William J. Hamblin has offered some good starting points in considering the relationship between the ancient Israelite temple ritual and the modern day LDS temple endowment. It is from this vantage point that we should approach trying to understand these ancient ritual systems and the connections they might have with the Latter-day Saints temple ritual. “When considering the possible relationship between ancient Israelite temple system and the LDS Endowment, the first thing to note is the basic purpose of the ancient temple was to reconcile Israel with God and bring all Israel (represented by the twelve stones inscribed with the tribal names) back into the presence of God (that is recapitulating the Sinai theophany), symbolically represented by the Holy Place and Holy of Holies within the veil. Another important point to realize is that Christ was the last great blood sacrifice when He came in the meridian of time and offered the Atonement, which ended sacrifice by the shedding of blood (3 Ne. 9:19; cf.Mosiah 13:27; Alma 34:13; 3 Ne. 15:2–10). Since Christ was the last blood sacrifice (all precursors pointing to Him), from that point onward the outward nature of sacrificial ritual changed, but still pointing towards Christ, and still a sacrifice of a broken heart and contrite spirit (3 Ne. 9:20–22; Psalms 51:16–17;Psalms 34:18). See the gallery below for various artists’ depictions of the rituals inside the ancient Israelite temple. Click each image to enlarge. Approaching the altar of incense and the veil. Prayer before the veil, with uplifted hands. Sprinkling the atoning blood on the mercy seat. Prayer before the altar of incense. Offering incense on the altar. Sprinkling blood on the mercy seat. Theophany of the Lord on the mercy seat. First oneClimbs Documentary: “Reading Temples” Now on YouTube! Did you know that you can “read” temples? What if all of the temples around the world today constituted a vast library of new scripture just waiting to be read if we had eyes to see? This presentation covers some basic concepts relating to LDS Symbology and a guide to approaching the subject of learning symbolism. This video presentation incorporates my first attempt at presenting principles related to “reading” temples. The content of the video is suitable for all ages and anyone interested in learning how understanding symbols can play an incredible part of their spiritual lives. Reprinted by permission from By Study and Also By Faith: Essays in Honor of Hugh W. Nibley on the Occasion of His Eightieth Birthday (Salt Lake City: Deseret Book and FARMS, 1990), 1:458–81. Aristotle observed that “nothing is by nature a name or a noun.” That is, words or word-names have no inherent or necessary meaning. Instead they are arbitrarily assigned to objects or persons. For different reasons, it is a standard view today that names, as well as concrete or abstract terms, are no more than a flatus vocis, a mere sound. All of the notes below are taken directly from the Temple Institute which is an organization seeking to rebuild the third temple on Mount Moriah. Below is a transcript of a presentation by Don Bradley on some temple-related themes that may have been present in the lost 116 pages via fairlds.org. He makes some really interesting points and I was fascinated with the relationship between the items in the ark of the covenant and the Lehite relics (Brass plates, Liahona, Interpreters/Breastplate and Sword of Laban) that may have served a similar purpose in the New World temples. I’d like to do a little more research and perhaps put together an article on those four relics and the parallels to the decalogue tablets, manna and rod of Arron in the ark. Anyway, on to Don Bradley’s presentation! Since you’ve all read the title of my presentation today, “Piercing the Veil: Temple Worship in the Lost 116 Pages,” I should begin by answering a few questions. The following is taken straight from TempleStudy.com, thanks Bryce for putting these videos together in one place. The conference “Mormonism and the Temple: Examining an Ancient Religious Tradition,” which took place on October 29, 2012 in Logan, Utah, was filmed, and some of the videos are now available for free in 1080p HD resolution on the Academy for Temple Studies YouTube channel, the Academy’s TempleStudies.org website, as well as embedded below here. The rest of the presenters’ videos are forthcoming. This Christmas I had some thoughts about the gifts that were given to the young Jesus by the wise men. I haven’t had time to really dig down deep and see what I can unearth concerning gold, frankincense and myrrh but I did have a few unique ideas that I don’t think I’ve ever read about anywhere else so I thought I’d take note of them here. 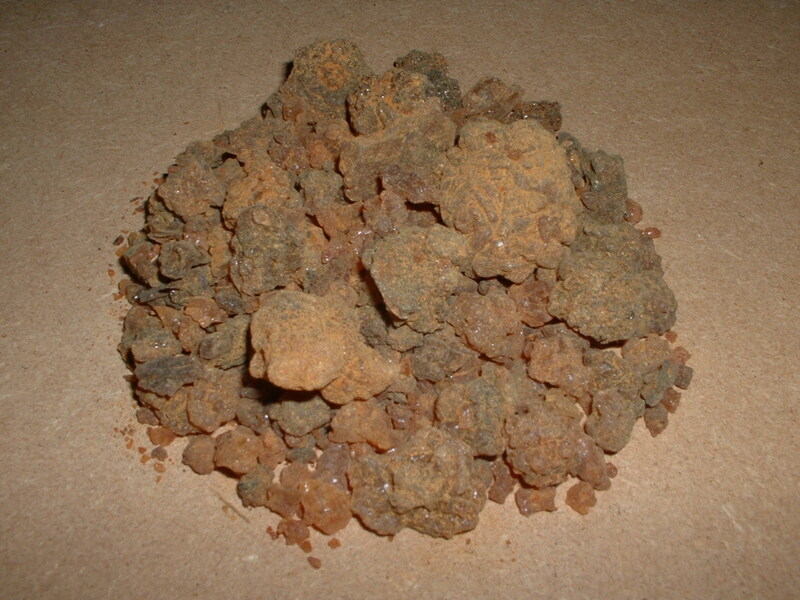 Gold can be primarily obtained by mining it from the earth or panning it out of rivers in tiny flakes. It is rare and must be sought for diligently and then purified by immense heat to flush the dross out. Gold does not rust under the same circumstances as other metals, it is extremely stable and attractive. How about taking a nice long trip down the rabbit hole of symbolism? Scott Onstott’s mind-blowing video details some of the world’s most fascinating symbolism hidden in plain sight, from Egyptian lore tied deeply within major cities of the world like Washington D.C, San Francisco, London and Paris, to the ratios of the universe and solar system embedded in to ancient megaliths. Set aside a good 3 hours and 43 minutes for a mind-bending tour laced with unbelievable parallels that defy coincidence. At first, the video might seem a little conspiracy-theoryish, but give it a chance and wait for the math. You’re in for quite a ride to unlock mysteries more captivating than any fictional thriller. Truth is truly stranger than fiction and it is all right under your nose. That said, hopefully this film can help to expand your vision and open your mind to a greater capacity to realize the immensity of hidden truths that do, in fact, surround us. Moses came down from Mount Sinai, carrying the Ten Commandments. His face was shining brightly because the Lord had been speaking to him. But Moses did not know at first that his face was shining. When Aaron and the others looked at Moses, they saw that his face was shining, and they were afraid to go near him. Moses called out for Aaron and the leaders to come to him, and he spoke with them. Then the rest of the people of Israel gathered around Moses, and he gave them the laws that the Lord had given him on Mount Sinai. The face of Moses kept shining, and after he had spoken with the people, he covered his face with a veil. Moses would always remove the veil when he went into the sacred tent to speak with the Lord. And when he came out, he would tell the people everything the Lord had told him to say. They could see that his face was still shining. So after he had spoken with them, he would put the veil back on and leave it on until the next time he went to speak with the Lord. The Law of Moses brought only the promise of death, even though it was carved on stones and given in a wonderful way. Still the Law made Moses’ face shine so brightly that the people of Israel could not look at it, even though it was a fading glory. So won’t the agreement that the Spirit brings to us be even more wonderful? If something that brings the death sentence is glorious, won’t something that makes us acceptable to God be even more glorious? In fact, the new agreement is so wonderful that the Law is no longer glorious at all. The Law was given with a glory that faded away. But the glory of the new agreement is much greater, because it will never fade away. This wonderful hope makes us feel like speaking freely. We are not like Moses. His face was shining, but he covered it to keep the people of Israel from seeing the brightness fade away. The people were stubborn, and something still keeps them from seeing the truth when the Law is read. Only Christ can take away the covering that keeps them from seeing. There are a number of interpretations of the veil’s symbolism, all of which reflect truths that are worthy of being dramatically enacted before the wedding service. The veil is a symbol of the married woman. It expresses a dignity, which Isaiah (3:18) calls tiferet, and which was reserved for women of station. Ezekiel (16:20) speaks of “covering with silk” the woman he loves. Interestingly, Rebecca does not wear a veil while on the journey in the company of the servant, Eliezer, but instinctively dons it when sighting Isaac. This may account for the insistence of major authorities that the groom himself veil the bride, and that it should never be done without him—it is only his presence that makes her veil significant.